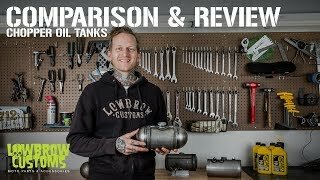 Not all oil tanks are created equal. Lowbrow Customs makes the best possible oil tank for your vintage Triumph or custom British motorcycle. Why is it the best? Our oil tanks feature three mounting points, two top and one bottom, to ensure that you have secure and stable mounting. This is only important if you actually ride your motorcycle; we do, and these tanks are road-tested and ready for anything you can throw at them. We also have ready-to-weld mounting kits for 500 and 650 c.c. 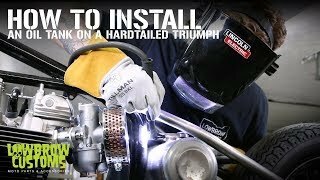 Triumphs to make install a breeze! Your choice of oil tank mounting kit with aluminum washers or mounting kit with brass washers. Instead of welded fittings to the top of the tank, our vent and return fittings have furnace-brazed tubing, keeping all the fittings nice and tidy at the bottom of the tank for easy oil line routing. Our oil tank end caps are spun steel with tooling made specifically for our oil tanks. All of the the components that make up these tanks, including the steel, are USA-made. Designed for your motorcycle, every single piece of our oil tanks are custom, from the smallest detail on up. We didn't use any off the shelf parts; we used our brains, hard work, and our drive to bring you the best parts we can. All of the people associated with the production of these oil tanks are highly skilled professionals, and you can tell from the quality of the machining to the beautiful TIG welds. Accept nothing less and look no further, these are the nicest oil tanks available. Congratulations, your search is at an end. Made in the USA. - Center fill with vented aluminum filler cap. - Oil return fitting on bottom is restricted inside the tank the same as stock and has the proper 'T' for feeding oil to your rocker boxes. - Two 5/16"-18 mounts on top and one 5/16"-18 mount on bottom ensure sturdy and stable mounting. This tank comes with a vented, aluminum 1-5/16"-12 thread filler cap. There are a variety of custom style oil and gas tank caps sold separately, including brass, aluminum, and cast aluminum styles from brands such as Lowbrow Customs, Mooneyes and LC Fabrications. You can easily change up the style and look of your bike with a different filler cap. Please note that there are both vented and unvented caps, this oil tank comes with an unvented cap as the oil tank is vented from the vent fitting at the bottom, though you could really use either style cap you like. The oil tank arrived fast and is exactly what I was looking for to put on my 69 bobber build. Love the tank. Love the look. And the brackets for this tank allow for a smooth custom finish.